The retort thermometer was developed in co-operation with leading canning companies to match the particular requirements of the industry to both safeguard public health and to produce canned foods of the highest quality. 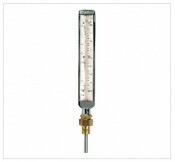 As well as instruments manufactured under the Russell Scientific Instruments' name, we manufacture, service and repair Tetcol retort thermometers, Short & Mason, Tycos, Taylor and other makes. The scales are very clear and easy to read. The datum line is used to show that the tube has not moved. The frame and scales are all numbered for record keeping purposes. Installation of the thermometer is very easy as the swivel nut turns freely on the stem. 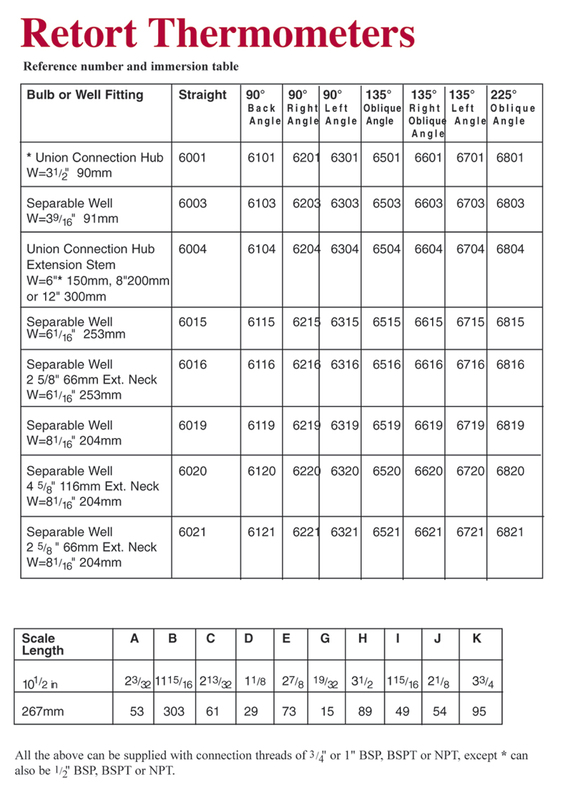 A retort thermometer can be installed very quickly in a separable well. The separable well connection is installed permanently in the apparatus as this gives it the best resistance to prevent contamination, and eliminates any need to draw-down the plant. Pipe thermometers are a budget instrument for checking the temperatures of liquids flowing through pipes. They are available in two forms: straight or right angle. Immersions, connection details and temperature range are all available on application to match your design and specific requirements.